Sereniten Plus is a combination of Lactium® casein decapeptide, L-Theanine and Vitamin D to support the Hypothalamic-Pituitary-Adrenal (HPA) axis and feedback loop for metabolic support, stress management and cortisol regulation. Lactium® and L-Theanine have been shown to provide a calming effect and may support normal sleep that is affected by stress. The neurochemical and hormonal reactions to stress are regulated through the Hypothalamic – Pituitary – Adrenal axis (HPA axis) designed for acute stressors that resolve rapidly. Present day chronic, low – grade stress results in the continual release of CRH (Corticotrophin Releasing Horm one) from the hypothalamus. This chronic secretion causes dysfunction in the HPA axis, desensitizing the hypothalamic and pituitary receptors to negative feedback from adrenaline, noradrenalin and particularly, cortisol. Loss of negative feedback within the neuro – hormonal system results in a multitude of health issues. It increases the production of ADH, aldosterone, and angiotensin increasing vascular vasoconstriction and sodium retention. Additionally, it directly increases LDL production as well as glucocorticoid and mineralcorticoid release. When the negative feedback loop within the HPA – axis is disrupted, chronic hormonal secretion becomes “normal” for that individual. In this state, they either fail to recognize they are stressed, or they may experience exaggerated emotional and physical response to every stressor including intolerance to noise or light, or feeling overwhelmed by simple tasks. Stress affects so many aspect of health that it is becoming crucial to rebalance the HPA – axis. Lactium®, a bioactive decapeptide, alpha – 1 sequence isolated from milk is effective in not only decreasing glucocorticoid secretion supports the HPA pathway. Lactium® works at three areas of the HPA – axis: 1) Lactium® binds specifically to the BZD site of the GABA – A receptor and does NOT bind to the PBR site of the GABA – A receptor responsible for the sedating effects seen with benzodiazepines. 2) Lactium® increases the sensitivity of the hypothalamus to cortisol, re – establishing receptor sensitivity feedback within the HPA – axis. It reduces the amount of CRH produced in response to stress. 3) Lactium® decreases the amount of cortisol released by the adrenal glands during acute and chronic stress. 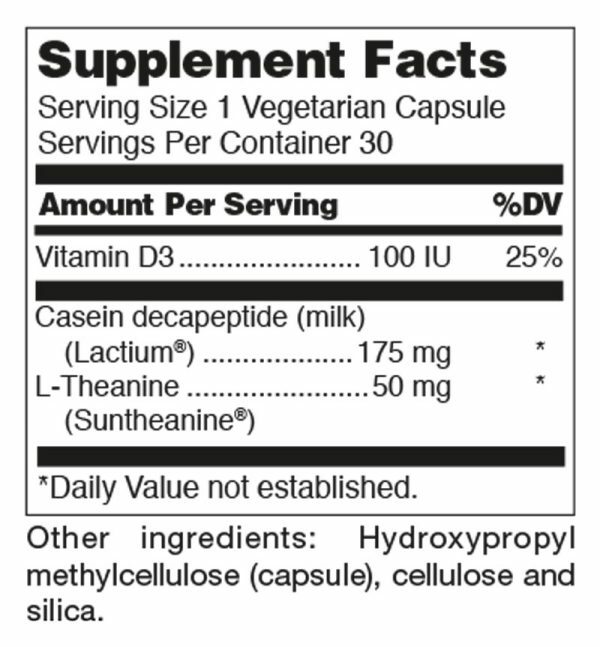 Studies in humans using alpha – S1 – casein decapeptide have resulted in calming effects, without side effects. Results showed a significant decrease in plasma cortisol throughout the combined stress tests and stable heart rate in the treatment group but not in the placebo group. 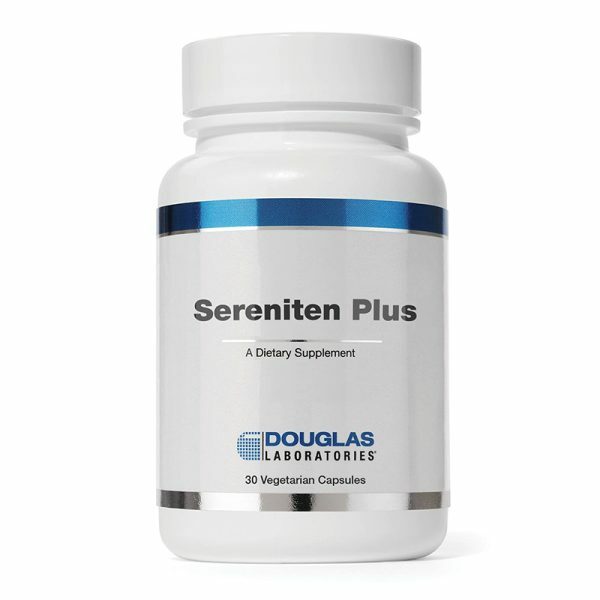 Another study showed after 30 days of supplementation a reduction in stress related issues including digestive , cardiovascular, intellectual, emotional, and social. L – theanine is a unique amino acid found naturally in green tea providing relaxation support without drowsiness. L – theanine has been shown to increase alpha – wave production, an observed pattern considered to be an index of relaxation. Vitamin D has been included for additional support of immune function that may be compromised during stress . Vitamin D has many functional r oles in the body, including modulation of cell growth, neuromuscular and immune function , and bone health.